Can we achieve world peace by using a dating app? That’s the challenge taken on by Verona, a mobile app (spotted by the Israeli daily newspaper Haaretz) used to match Palestinians and Israelis, whether they’re looking for true love, or just a simple, peaceful contact with the Other. The user signs in via Facebook, scrolls through profiles and swipes the screen left or right depending on if they like what they see or not. It’s almost exactly like Tinder… Except that first, they say whether they are Palestinian or Israeli, and only have access to profiles from the other country. The creator of Verona, Matthew Nolan, 31, is from New York. He says he thought of the idea when watching a couple of friends. So far the app has been downloaded more than 1,000 times. “I was talking to a Palestinian friend who had a new Israeli girlfriend”, he said on the site Refinery29. “We were joking about JDate (a highly popular dating site for members of the Jewish community, Ed. Note). I said ‘We should make a J-P Date, Jewish-Palestinian Date’”. As for the name, it was chosen in reference to the famous city of Romeo and Juliette. Ronald Hatto, Professor of International Relations at CERI-Sciences Po, didn’t hide his scepticism. “It’s an original idea”, he told us, “But the two sides are so radicalised that I can’t see how a cute app created by a guy from New York could bring people together. We’ve all seen the recent elections in Israel. Everyone thought Netanyahu was going to lose, but in fact he won. It’s a bad sign for the peace process. And as for the Palestinians, there’s not much to be more optimistic about. Let’s just say that if it works, he deserves to win the Nobel Peace Prize”. It’s true this project is nothing if not ambitious, especially in light of the Palestinder experiment. Last July during the resurging Israel-Palestine conflict, a group of young Americans travelled to Ramallah in the West Bank. They were on a humanitarian mission to teach English. The group decided to sign up to Tinder and start talking to Israelis. 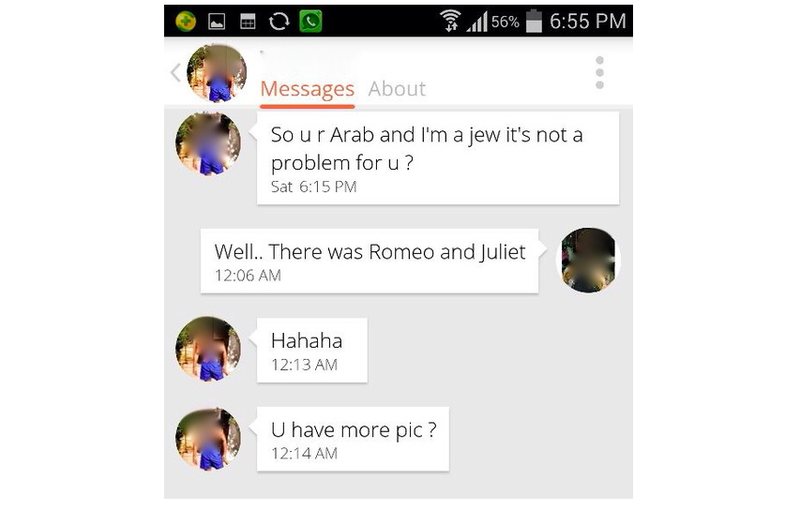 They then posted screenshots of their exchanges on a Tumblr called Palestinder. – Where’s Palestine again? I’ve never heard of it. – Is that a joke? – I live in Israel, and it’s not a joke, that place doesn’t exist anymore. There are towns in Israel where Arabs live, and that’s why Palestine doesn’t exist. – Hey! What are you doing in Ramallah for the summer? A part from trying to stay alive? – I don’t speak Hebrew. – Don’t worry. I can read numbers. Send me your number. – So you’re Arab and I’m Jewish, that’s not a problem for you? – Hahaha. Send me some more photos? There’s just one little hitch. If Verona, more than Tinder, manages to create love between Palestinians and Israelis, the happy couples will still have to cross checkpoints to meet up… And that’s a whole different ball game.